Hello everyone, CEO Olivia here. This week I will be having dental surgery. I have a cracked tooth. It might be from chewing on a bone or I cracked it during a seizure. Regardless, it’s in need of repair. While I’m under I will also get a thorough teeth cleaning & will be xrayed to make sure the rest of my teeth are in good shape. It just so happens all of this is happening now, in February which is National Pet Dental Health Month. 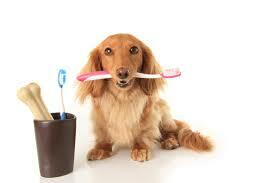 Good oral hygiene is as important for us good dogs as it is for you humans. In a previous blog post, I barked about a homemade toothpaste for good dogs. A small toothbrush or a piece of gauze with a dab of toothpaste can help keep our teeth clean. Some good dogs may find it uncomfortable at first. Be patient & try to make it a positive experience. If it tastes good & gently massaging our gums feels good, it can be a rewarding bonding exercise. My huMom cleans my teeth with a small finger sock that she made from scrap hemp canvas. I like the smell & taste, it’s soft, yet with a dab of Clean Teeth Gel it works wooftasticly. I didn’t like using gauze or other cloth so this was a big help for huMom. Our good furriend Dista from Critter Comforts in Napanee, ON. did these two short videos for Knotty Toys for Good Dogs about brushing your good dog’s teeth. My surgery will be on Wednesday morning, February 6th. Please send pawsitive thoughts. We both know I’m in the very best care but huMom will be anxious while I’m under anesthetic. Paws crossed for you, Olivia, and your mom. I’ve been the one anxiously expecting surgery to be finished, worrying about my pet. I know how hard that is too. Here’s to a good surgery and easy recovery! Thank you 💜nose nudges💜 We were ready but after arriving at the clinic it was decided to reschedule due to bad weather. We drove through freezing rain & it promised to get worse. There were also power outage warnings. Everyone thought it would be best. Keep us posted for the re-scheduled surgery. It makes sense- you need the hospital to be fully staffed and focused on Olivia rather than the weather and perhaps a few employees short. We’re sending you lots of POTP that your dental surgery and cleaning all goes well and our HuMom is sending your HuMom lots of warm, comforting hugs to help ease her anxiety. Thank you 💜nose nudges💜 The day of the surgery we drove through freezing rain to get to the clinic but after getting there the weather promised to get worse. There were possible black outs. It was decided it was best to reschedule until the 27th. All best wishes for your dental visit. We know February is National Pet Dental Care month and will keep our paws crossed for you!